S2K Inventory Management System is a fully integrated inventory control system designed to maximize your ROI and effectively and efficiently handle all your inventory related processes. 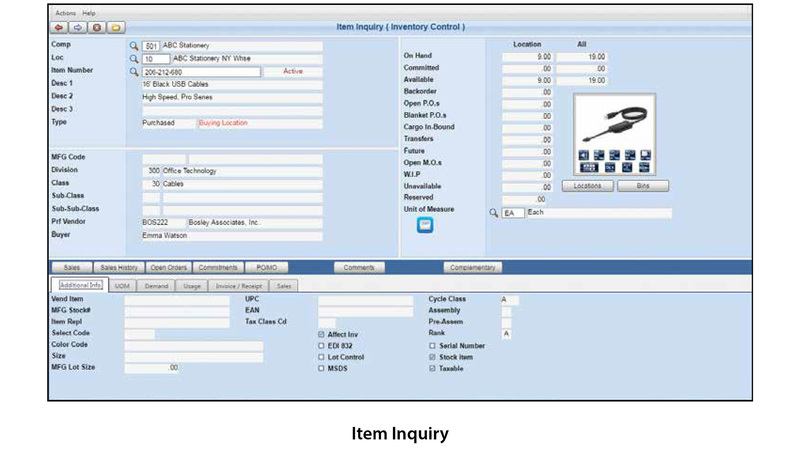 With S2K’s Inventory Management System applications, you have complete inventory control. You can track order commitments and shipments, inventory adjustments purchase orders and receipts, open work orders and WIP, and build kits. You can create and manage warehouse transfers and inter-company transactions, track lots and shelf life dates, track serial numbered items and much more. Comprehensive item inquiries provide a complete stock status of every item with drill down to transaction details, which can help you improve customer service. In addition to a myriad of standard fields, S2K Inventory Management allows for an unlimited number of user defined fields that can be attached to the item master or the item balance file. Dynamic SQL searching makes it easy to find items by a wide number of data fields including part number, description, UPC, EAN, manufactures part number, vendor, product divisions and classes, and much more. Users can also link substitute and complementary items to improve fill rates and encourage up-selling. Multiple units of measure can be established with conversion factors for each item. Multiple UPCs (GTIN) make it easy to track the bar codes of each unit of measure in the warehouse. Serial number and lot control features provide complete tracking and historical data of every transaction. 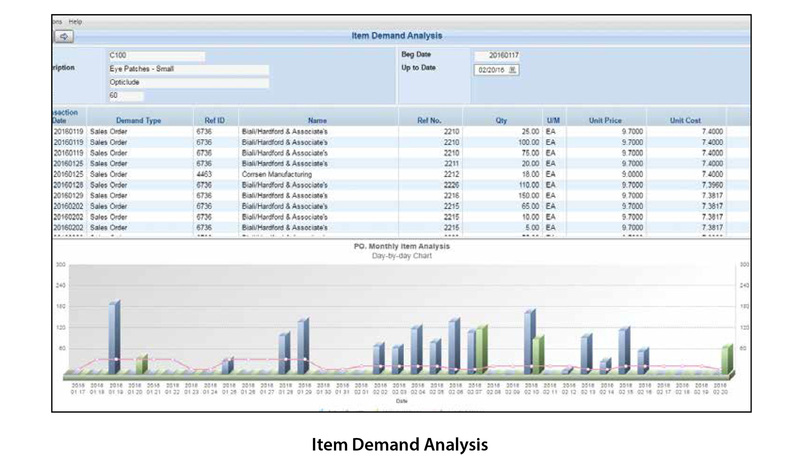 S2K Inventory Management utilizes the latest inventory reordering formulas to calculate reorder points based on historical or forecasted usage, vendor lead times, seasonal trends and demand. Buyers will have access to EOQ calculations that can point out the most cost-effective choices. Items can be grouped into buy-lines for purchase analysis by product group to take advantage of special pricing and discounts. Global inquiries provide quick views of current availability, dead stock items, inventory value, turns and suggested reorder quantities. Warehouses and individual items can be flagged for centralized or decentralized purchasing and replenishment. S2K Inventory Management encompasses import cargo tracking that allows you to track VAI’s product movement and calculate a true landed cost for each imported item. With complete integration to S2K Purchasing application, users can track containers, and the carrier, and view the estimated time of departure and arrival of every shipment. Users can assign unlimited number of cost factors to each shipment or item, and allocate each cost by unit, weight, cubic measure, or cost. S2K Customer Relationship Management (CRM) software improves your bottom-line by strengthening customer loyalty. This CRM suite of applications is a cost-effective way to identify, acquire, develop, and retain your most profitable customers. With one central database, our customer relationship management software allows you to use your existing technology while providing an enterprise-wide view of all interactions with customers and prospects. This customer relationship management software has an integrated contact management feature that provides real time access to all customer and product information, and marketing automation tools that generate effective, consistent and timely campaigns. S2K CRM software gives you unlimited user defined fields, at the customer, contact, and opportunity level to provide you with a flexible database for searching and analysis plus detailed notes to help track all communications within each account. S2K CRM software gives everyone in your organization access to the same, up-to-date information, allowing them to react quickly to customer demands and provide the highest level of customer service. Take advantage of your contact database with automated marketing campaigns that allow you to email, fax or mail sales or promotional related material directly from the sales team dashboard. S2K CRM software contains advanced sorting criteria options that enable you to select a specific target audience for your campaign. By using the group e-mail feature, you can send promotional sales information, item coupons, new product information, updated price lists and collateral instantly to selected contacts. Export options allow you to import lists into online marketing tools for advanced campaign tracking and analysis. All campaign broadcast information will be noted in the contact management notes file for easy review and follow up. This powerful tool allows you to increase the relevance and timing of your marketing messages, develop long-lasting customer relationships, and provide a valuable “dialog” for additional customer contact. 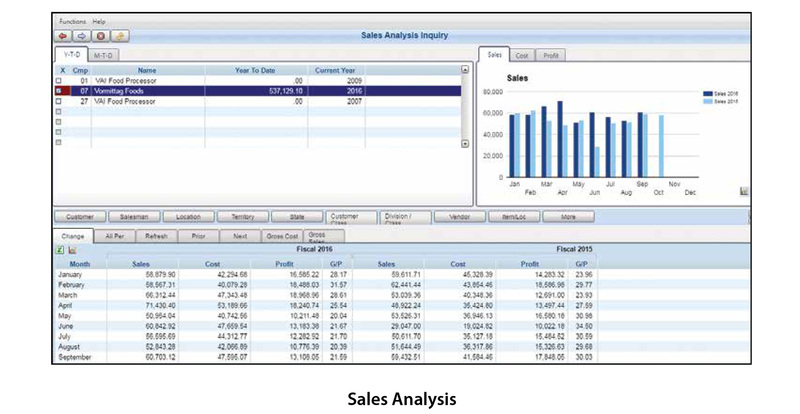 S2K CRM data is the foundation for our S2K Sales Force application. Today, immediate access to CRM and enterprise data is essential to your sales team in order to be productive. S2K Sales Force is a comprehensive online sales tool optimized for the supply chain professional. It provides browser-based access to CRM and Enterprise data to allow your sales team to leverage mobile devices and make the most of every sales call, whether they are in the office or out in the field. Automated purchasing systems are a key tool in helping businesses reduce inventory and increase sales. They are imperative in helping maintain customer service levels and retaining your customers. Companies that utilize automated forecasting and purchasing tools will also have a strategic advantage in lower costs and increased profits. The goal with any automated buying solution is to generate purchase order quantities that support the company’s strategic goals for profits and customer service, while doing so in the most efficient and economic fashion. S2K’s Suggested Purchasing application can optimally push order quantities up to get prepaid freight, or to hit vendor minimums, or to cube out a full container, if desired - all while honoring pack sizes. Additionally, it can consider multiple warehouses in the distribution network and check for overstocked items and facilitate stock transfers before buyers place orders to the vendor. By calculating the costs and upcoming demand for each of your items, S2K Suggested Purchasing can tell you if a vendor incentive makes economic sense, and if so, how much more of each item to buy. By leveraging historical sales data, systems can forecast demand and predict long-range trends, as well as seasonality for each item. VAI’s forecasting system captures seasonality and trends, and calculates how volatile the sales are for each item. No matter how good the forecasting system is, there are always going to be items with volatile and unpredictable swings in sales beyond seasonality and trends. By incorporating sales volatility per item into the safety stock calculations, companies will be covered for sales spikes that occur above the forecasted demand. S2K Suggested Purchasing evaluates all demand and supply requirements to create time-phased replenishment plans for each product at each location. The typical distributor stocks thousands of items at each warehouse. Buyers and planners do not have time to manage each item individually; they need to focus on selected items that require action. S2K’s Suggested Purchasing application performs the complex calculations for each item at each location, and then flags those items with specific conditions hat are beyond user defined tolerances. Most importantly, the company’s capabilities to handle important clients are greatly improved because the investment in inventory versus customer service tradeoff is now visible and controllable. Many distributors have made the strategic decision to gain cost efficiencies by importing products from other parts of the globe. Although this can certainly lower unit costs, it creates complexities in other areas such as significantly increased and variable lead times. This poses a new challenge to buyers and planners, who must now place orders for products that will not arrive for months. Automated purchasing systems can factor in the lead time for each item, at each location, in its calculations of optimized order quantities. They also factor in the variability of the vendor lead time into its safety stock calculations to provide insurance against late deliveries.